Gazzam Lake Trail, an earlier BILT Acquisition. For more details/info on the day’s festivities, visit the BILT website to learn about shuttles and parking. 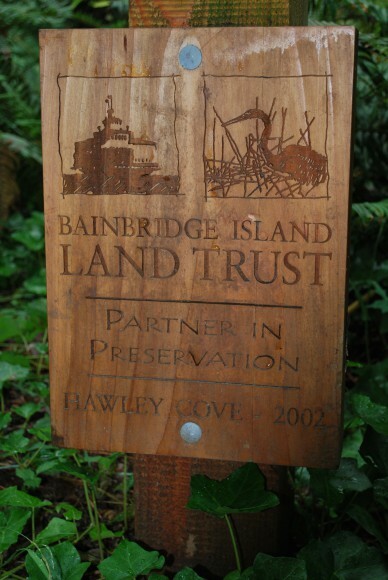 Many people move to Bainbridge island to escape city life. Supporters of BILT realize that development must be smart and conservation must be part of every new project if we hope to keep our island green and beautiful for generations to come. I have been very excited about this Hilltop Acquisition because it creates an amazingly large open and protected space (540 acres) at the center of our island. After each real estate closing I donate 3% of my commission check to local housing charities. 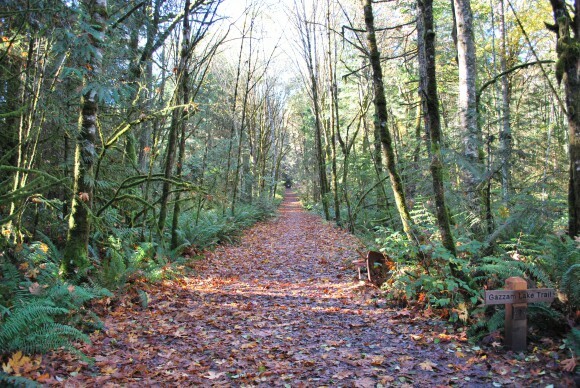 Land Trust is one of those groups. I have focused my donations this winter and spring to Land Trust as they finalize the purchase of this Hilltop property. I look forward to next Sunday to explore this amazing gift to the island. Just across the Agate Pass Bridge, from Bainbridge, is Poulsbo. Poulsbo has a superb bookstore, bakery, and coffee shop – all the key ingredients. It is a great downtown to stroll through on a sunny or rainy day. Of course there is shopping and dining (several options), but there is also a small aquarium, ice cream, a winery, and it is all along the waterfront. You’ve Moved in, Now What? But, we know the new home owners have a long list of things to do too. Here are ten import items to make sure you check off your list. Ten things to remember after your move. Gas/propane, electric, cable, telephone, garbage service, and any other providers for your home must be called to ensure service is in your name. Double check what day your garbage will be picked up(order cans if you need to) and when your bills will be due. If you just bought a house, hopefully you had a home inspection. You may not have the time, energy or money to deal with all or any of the items on your list right away, but don’t forget about the big repairs you may need to make, especially before winter comes your way. Take the time to locate the main breaker box for your home and label each breaker correctly if not labeled already. Locate the main water shut-off and make sure all household members know where this is located. It is also not a bad idea to purchase a water cut-off wrench in case it ever is necessary to turn off your water supply from the meter. I did not do this right away when we moved to Bainbridge Island, and I regret it. Print media may be dead in many ways, but the local paper, small as it might be, is a good way to find out about local politics and the inner-working of your new city/town. Don’t forget to inform creditors and magazine subscriptions of your new address. In most areas, you can now change your address online through the Post Office. Make sure your old post office is forwarding your mail correctly. Make sure your street number is identified and easily visible from the road. Reflecting house numbers on your mailbox work well. Many streets on our island do not have street lights. You may want to make sure your street numbers light up. Files that are related to your move such as receipts, manuals, warranties, etc. I give my clients a hard copy of the real estate transaction and I burn all the files onto a CD too. 9. Check out the area to locate new physicians, dentist, vet., etc. Ask your new neighbors kid’s teachers, the clerk at the store, get local references. After you meet your new neighbors write down their names and phone numbers. Put the info in your phone contacts. Helpful to have in a pinch. For many helpful move-in numbers check out the Community Resources Section of my website. 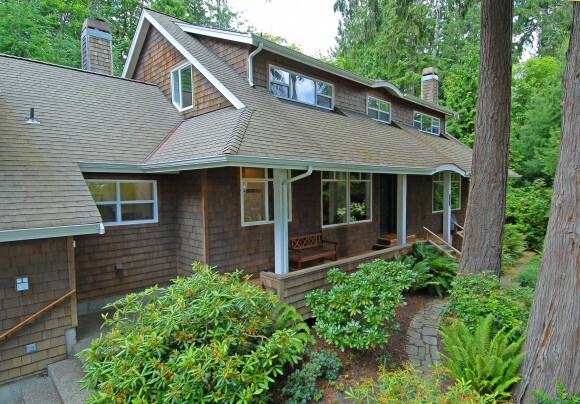 5795 Wimsey Lane on Bainbridge Island. 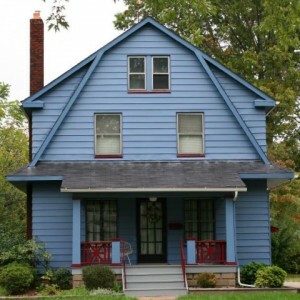 Closed on 3/31/11 for $535,000. Sold by Jen Pells, Windermere West Sound. This winter and early spring I have been involved in two short sales, a bank sale and this sale on Wimsey Lane, which was a bankruptcy and short sale combination. There is no “easy button” in this business. The home above is a wonderful home on an amazing street. I am envious of the buyers because they got an amazing deal. I was glad I could play a part on the listing side and be successful at obtaining bankruptcy court approval and lender consent on the short sale side. During the course of this listing there were five offers, the loan was sold twice and then the home became part of a bankruptcy. Quite the journey. Good things don’t come easily. Congratulations to the happy new buyers and bravo to my sellers and the trustee, we did it!